Happy Mother’s Day! May your offspring have a strong legacy, which embraces everything you are and wish for them! Food52 got me thinking with their ‘Dish you would like to be remembered for’ contest. And think I did. I don’t think there’s one dish that defines me, that cohesively brings together the sum of my parts. But even as I think on the legacy I’ll bequeath to my three, my mind rides the Ferris wheel of life and I get off on the 7th of May, 1988. I watch my mother, on her 40th bedecked in green and gold, celebrating 4 decades on earth. My recollected treasures centre around her beauty. The manner in which she embraced diversity, of people, of thought, of life. How she encouraged us to work hard at all we did, like she. Even though we had ‘help’ growing up, we still learned to cook, clean and do our bit. No, we weren’t spared any chores. She had a vision to teach and run her own schools, and that she did and has done for 30 years. Thank you mom for being the greatest role model a girl could have. Five years from 40 myself, I wonder if I’ll have reached that place I saw in the heat of Nigeria’s 1988. If my girls and boy will look on me with wonder and admiration. If I myself would have reached that place in the world of ‘establishment’, doing what I want, how I want, and loving it – the accomplishments and challenges (please don’t ask me yet what THAT is, as it is no singular thing, but a mashup, whose main characteristics are combination, visualization, and aggregation, be sure that it includes food though). But that’s still half a decade away. In the interim, I want them to think of me as fashionable in spite of flat shoes and everything else, having eyes in the back of my head…..seeing all their escapades with incisive vision. I want them to be comfortable with diversity, be it of opinion, in travel, with people of different abilities, backgrounds and inclinations. I want them to recycle, to separate paper, food and plastic. This may spark off a devotion, a desire and a conviction to contribute to sustainability. And like a lot of foodies, I desire a deep appreciation for food, comfort with ingredients, textures and myriad flavours. Though I’d make an exception when it comes to liking ‘octopus’. I will not force them on that score. And while I don’t think one recipe will totally encapsulate me, as their mother, I’ll share one that has elements of me. Though it wasn’t easy to pick one. I considered a recipe I love and which has my husband in food heaven but which my children hate (Paella). In the end, as it is Mother’s day I went with a recipe which says ‘Mama’ and involves Marshmallow fluff, cousin to pillowy marshmallows. My children love S’Mores. We first had them last May at GS camp. But I considered them a make-do version as we used chocolate-covered Dutch biscuits and not wheaty grahams. But that was till my friend surprised me one evening a few months later with a gift of a S’Mores kit. 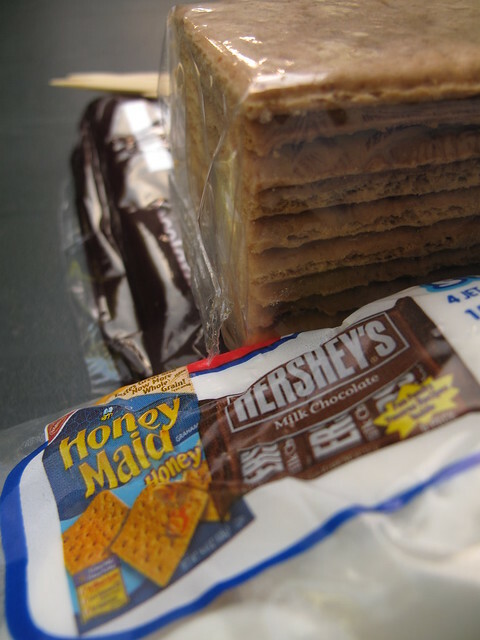 It consisted of Graham crackers, jet-puffed marshmallows and Hershey’s milk chocolate. When she arrived, I was at the back, roasting peppers on the grill. She couldn’t have timed it better as I rigged up to make S’Mores. They were a hit…and we haven’t stopped making them since. It is a classic American marshmallow spread, commonly eaten straight from the jar with spoon, which is subsequently licked. Often spread on toast, and the filling in the classic Flutternutter – a sandwich spread with peanut butter and Marshmallow cream! The concoction, made of corn syrup (don’t scream), sugar syrup (please don’t scream), egg whites (same as in macarons) and vanilla (hard to hate plain ole vanilla), has been made in Massachusetts since 1920 and is mainly consumed in New England. And the Netherlands. And in NYC too! 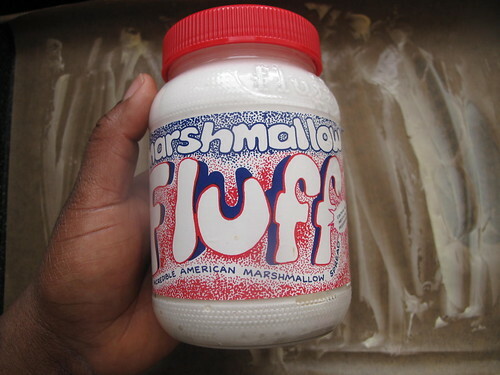 According to a 2006 Boston Globe article, Massachusetts State Senator Jarrett Barrios proposed a restriction on the number of weekly servings of Marshmallow Fluff (Fluffernutter) sandwiches in the form of an amendment to a bill that will limit junk food in schools. The proposal was later dropped. Heard of Magic Shell before? Note the chocolate mixture of oil and chocolate. It creates Magic Shell. And for the unknown, like I was, magic shell is an American dessert syrup produced by Smucker’s. Designed for ice-cream, it is a syrup that hardens quickly into a crispy shell once poured onto a cold surface, which is the origin of the product’s name. 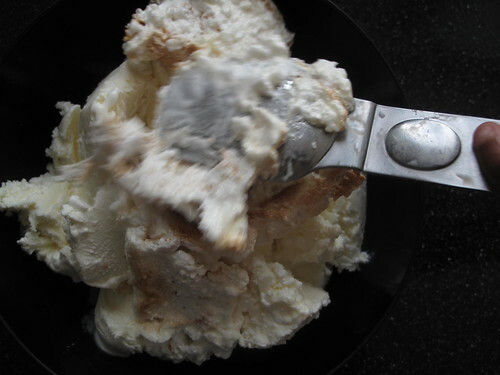 The “shell” effect in Magic Shell is due to the presence of coconut oil and sunflower oil, both of which contain high amounts of saturated fat, and sugar which produces a chocolate mixture which is solid at higher temperatures than would otherwise be the case with normal ice cream topping. Heat the broiler. Line a baking sheet with parchment and generously butter the parchment. 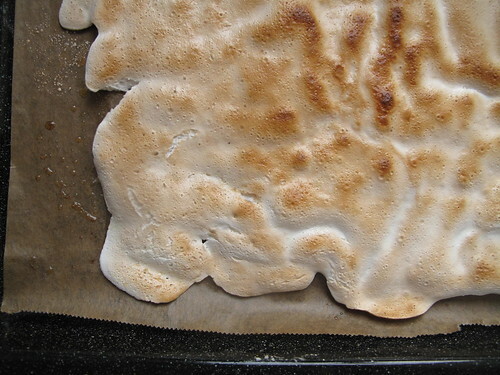 Spoon the Fluff onto the parchment. Wet your hands (or ask any daughter to do same) and pat out the Fluff into a thin layer that nearly covers the baking sheet. Place the Fluff under the broiler (about 6 inches from the flame) and toast all over. Remove the baking sheet from the oven. Using a spatula, turn in the sides of the Fluff, folding it like a letter, to expose the un-toasted portions. Place under the broiler and toast all over, again. Remove from the oven and let cool completely. Put the graham crackers in a sturdy plastic bag, and using either a rolling pin or the base of a small saucepan, pound the crackers into coarse crumbs. Spread half of them in the base of an 8-inch baking dish. Set out the ice cream for 10 minutes. The next step has two options. Do by hand or employ your mixer. Either way, place the ice cream into the bowl and using a spatula or the mixer fitted with a paddle attachment, mash the ice cream to loosen it a bit. Add the toasted Fluff and mix until just blended but not broken down — you want there to be chewy bits. Scrape into the baking dish and freeze. Meanwhile, melt the chocolate and oil in a double boiler, whisking until they’re smooth. 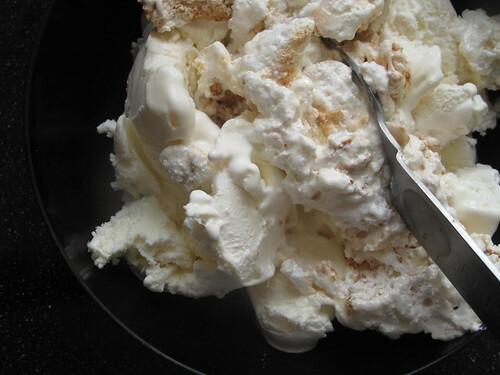 To serve, spread the remaining graham cracker crumbs on top of the semifreddo. Drizzle the top with as much chocolate as you like! Well, yesterday I tested this. 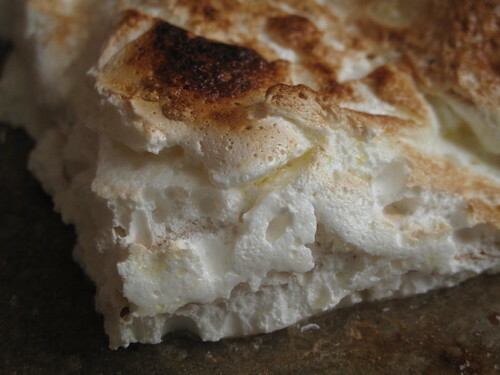 I grilled mini marshmallows and marshmallow fluff, to use in S’More verrines (which were a disaster for many reasons.) Anyhow, they grilled fine. The mini marshmallows looked pretty, having puffed and joined up to resemble some kind of flower. They had a crisp top but tasted horrible. Unlike the marshmallow fluff which grilled great and remained sticky, without any traces of bitterness. Why? 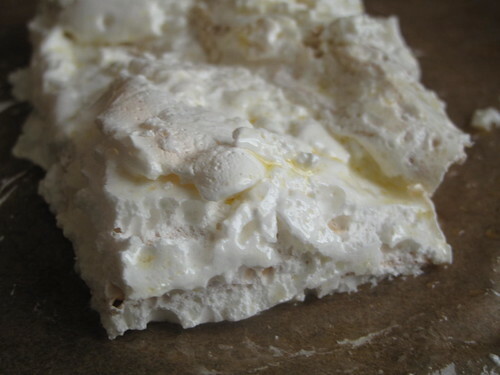 The stablilizers are different – (often powdered) egg whites for marshmallow fluff/cream and gelatin for regular marshmallows. The reason that marshmallows usually use gelatin is to give them some firmness, allowing them to be sliced and packaged in pieces. 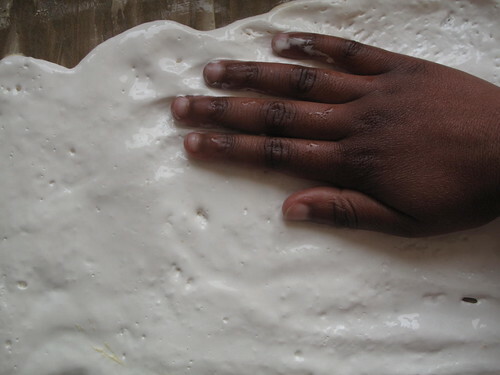 Marshmallow cream does not firm up and remains soft, even when it sits out for a while. Wherever you are, I wish you the very best for Mother’s day. Hope you’ve had many special moments – be it blooms or breakfast in bed! Chocolates, jewellery and lovely poems to read. From The Taylors of Ongar by Doris Mary Armitage, Cambridge: W. Heffer & Sons Ltd. , 1939. p. 181-182. S’More cupcakes from the Freckled Pumpkin! 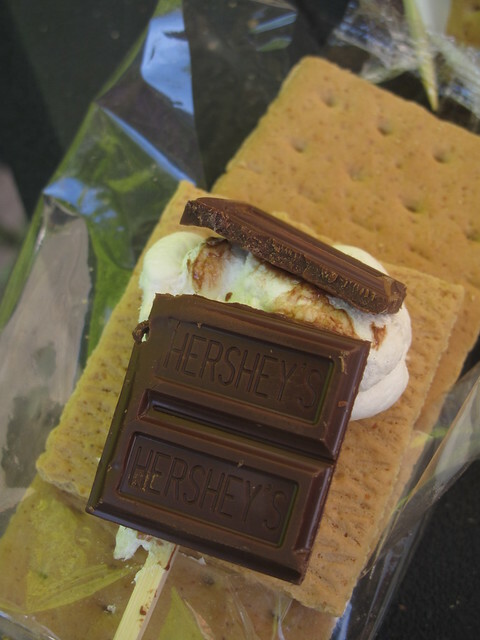 And from ‘Made with Pink’, obsessive S’More treats: S’More bars, another version of S’More pops and S’More cups, like PB cups! And finally, Cookie Crumb presents stunning looking decorated S’More cookies!